Centenary of the Armistice - ringing at Bourn, Cherry Hinton, Chesterton, Dullingham, Duxford, Fen Ditton (here and here), Fowlmere, Foxton, Great Wilbraham (here, here and here), Great St Mary's, Guilden Morden, Horningsea, Ickleton, Little Eversden, Melbourn (here and here), Meldreth (here and here), Pampisford (here, here, here and here), Sawston, St Andrew the Great (by the CUG), Thriplow (here, here and here), Trumpington, Whittlesford (here, here, here, here and here), Woodditton and Mawson Road. Special congratulations are due to Elizabeth Gibson, who learned to ring as part of the Ringing Remembers campaign and rang her first quarter peal at Duxford. Other ringers from Ringing Remembers who rang on Remembrance Sunday include Duncan Curry (Fen Ditton and Horningsea), Madhu Davies (Horningsea and Great Wilbraham), Caroline Hough (Cherry Hinton), David Nicholls (Great Wilbraham), Karen Osterfeld (Great Wilbraham), Rachel Paine (Great Wilbraham), Niamh Roberts (Whittlesford), Mervyn Rogers (Fen Ditton), Melanie Sinclair (Great Wilbraham), Anna Sugden (Little Shelford) and John Willders (Melbourn). Archibald Owen Carwithen Longridge (Trinity), former secretary of the CUGCR, died 12th October 1918 - touch by Cambridge University Guild in Cambridge, 11th October 2018. Thomas Laurie Coningsby (died 27th August 1918), brother of Bill Coningsby, who donated the trebles at Melbourn - peal at Melbourn, 28th August 2018. Cyril Frederick Smee (died 16th August 1916) - quarter peal at Cherry Hinton, 5th August 2018. Edward Newling (died 9th April 1918) - peal at Haslingfield, 9th April 2018. Henry Brodie Day (died 3rd February 1918), ringer at Melbourn - peal at Melbourn, 3rd February 2018. For more information, see here. 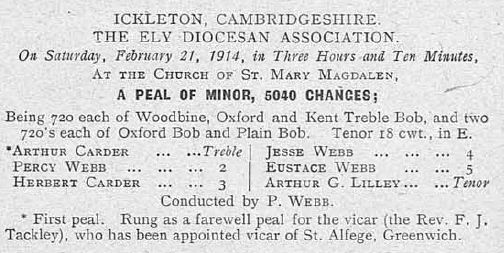 Eustace Webb (died 30th November 1917), ringer at Ickleton - peal at Ickleton, 30th November 2017. Arthur Edward Carder (died 9th August 1917) and Walter Barnabas Carder (died 13th September 1917), ringers at Ickleton - quarter peal at Ickleton, 10th September 2017. Herbert Reed, ringer at Sawston, died 31st July 1917 - quarter peals at Sawston and Sawston again, 31st July 2017. 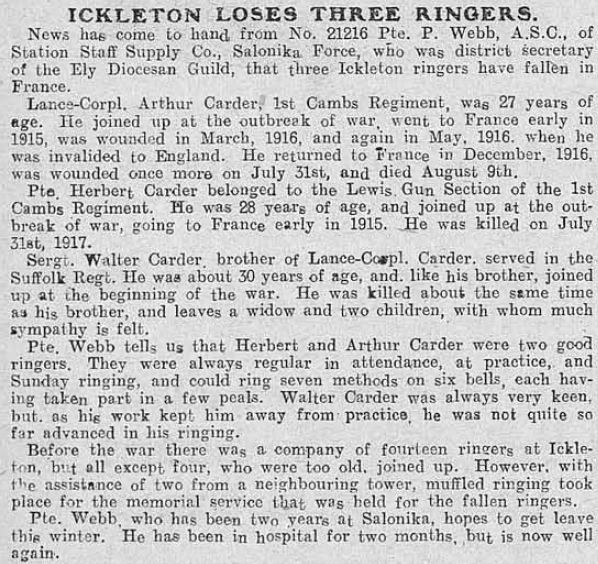 Herbert Carder, ringer at Ickleton, died 31st July 1917 - peal of Passchendaele Surprise Major at Ickleton, 31st July 2017. Centenary of the start of the Battle of Passchendaele - quarter peal at Great Wilbraham, 31st July 2017. Ernest Edward Meadows, killed in action, 23rd April 1917 - quarter peal at Little Shelford, 23rd April 2017. Centenary of the end of the Battle of the Somme - quarter peal at Cherry Hinton, 18th November 2016. Saki (H H Munro), killed in the battle of the Somme, 14th November 1916 - quarter peal at St Edward's, 16th November 2016. Percy Seaman, great uncle of Paul, died 10th July 1916 - handbell peal at Little Chesterford, 10th July 2016. Centenary of the Battle of the Somme - quarter peal at Little Eversden, 3rd July 2016. Charles Gillson, ringer at Fulbourn, died 2nd March 1916, age 20 or 21 - ringing at Fulbourn, 2nd March 2016. Raymond Frank Trigg, lost at sea 23rd October 1915, aged 19 - quarter peal at Trumpington, 25th October 2015. William Douglass James, former master of the CUG, died 25th September 1915, age 23 - quarter peal by Cambridge University Guild at St Bene't's, 27th September 2015. Edmund Basil Walker (died 18th April 1915), Frank Stewart Waddington Raikes (died 9th May 1915) and Victor Comley McKiever (died 18th May 1915) - quarter peal by Cambridge University Guild at Trumpington, 9th May 2015. 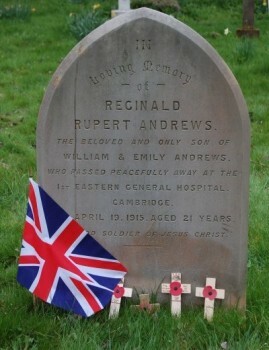 Reginald Rupert Andrews, ringer at Whittlesford, died 19th April 1915, aged 21 - quarter peal at Whittlesford, 19th April 2015. Ernest Frederick Green, died 1st November 1914 - quarter peal at Little Shelford, 2nd November 2014. Peal at Meldreth, 4th August 1914. 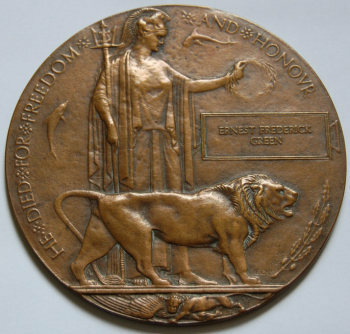 Cyril Frederick Smee, died 17th August 1916 - quarter peal at Cherry Hinton, 3rd August 2014.